Lightning Book Review - Itty Bitty Hellboy - Honk if you love justice! 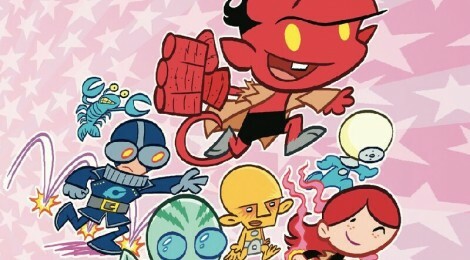 It might seem like an odd combination, Hellboy getting the cutesy ‘Itty Bitty’ treatment, but if you enjoy HB and want to get your younger ones in early, this is a good way. The bright, simple shapes are indeed cute, reminding me a bit of the Powerpuff Girls. Art Baltazar and Franco do a solid job with the art and stories, most of which are a few pages long and have simple kid-friendly jokes (Johann sneezes himself out of his suit, jokes about Roger’s underwear, and so on). I reviewed this TPB via NetGalley, collecting 5 issues of the comic. You can pick it up now, at Amazon.